Built: The dimensions of this tablet are 193.4 x 116.4 x 9.7 mm and it weighs about 310 grams. Display: The Samsung Galaxy Tab 3 LITE comes with a capacitive WSVGA touch display of 7 inches that provides a resolution of 1024 x 600 pixels. Processor: This tablet runs on a dual core processor clocked at 1.2 Giga Hertz. 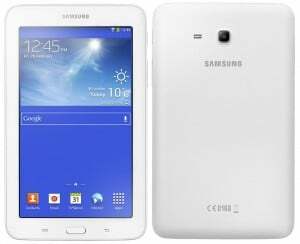 Software: The Samsung Galaxy Tab 3 LITE functions on Android 4.2 Jelly Bean OS with TouchWiz User Interface. Camera: This tablet also features a rear camera of 2 mega pixels. It will offer exciting features like Smile Shot, Shoot and Share, Panorama Shot, etc. Memory: The device carries a RAM of 1 GB and inbuilt storage capacity of 8 GB. Samsung Galaxy Tab 3 LITE also provides expandable storage space of up to 32 GB with the help of a micro SD card. Connectivity Features: The connectivity features included in this tablet are Bluetooth, Wi-Fi, Wi-Fi direct, GPS/ A-GPS, micro USB and GLONASS. It has a 3G variant as well. Other Features: This device has been pre loaded with a number of functionality and entertainment based applications, such as Flipboard, Dropbox, ChatON, Chrome, Google+, YouTube, Play Store, Play Movies, Samsung Hub, etc. Battery: The Samsung Galaxy Tab 3 LITE runs on a battery of 3600 mAh that is powerful enough to provide video playback time of nearly 8 hours. Our Take: The Samsung Galaxy Tab 3 LITE is quite a decent gadget with some interesting features. However, it will be facing competition from the budget tablets of other manufacturers like Micromax and Xolo when it launches in the sub Rs 15,000 price bracket.